March 8, 2018 | Gritty. Tough. Determined. These are words used often in women’s basketball, especially around the NCAA Women’s Final Four. To Trophy, however, there is someone who truly exemplifies these words – and this remarkable woman isn’t an athlete. 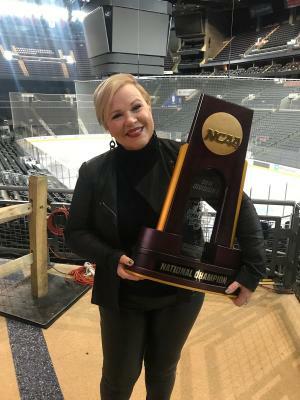 A mainstay in women’s basketball, this woman is none other than ESPN Reporter Holly Rowe! Holly has overcome incredible odds to succeed in the sports world, is a star in her field and a champion for women’s basketball. Holly has a great love for the game of basketball at both the collegiate and professional level. A self-proclaimed “sports nerd,” Holly grew up watching and playing sports with her father in a small town in Utah. Starting when she was in high school, she took whatever job was available so she could work in sports, and ended up covering many men’s and women’s basketball games in the process. Trophy learned that when Holly started at ESPN, she was still working full time at multiple jobs while raising her son, McKylin, as a single mother. She did it, she said, because she loved the work and was incredibly passionate about sports. Her hard work paid off, and Holly began to cover many events for ESPN, including football, volleyball and basketball. Her time at ESPN has spanned over 20 years and counting! Holly is still showing that same grit and determination she had when she was younger. Since 2015, she has been fighting an ongoing battle with desmoplastic melanoma, a rare and aggressive skin cancer. Though her fight has had its ups and downs, Holly considers her job in sports as the best kind of distraction, and doesn’t let cancer slow her down as she continues her work for ESPN year-round, including at the 2018 NCAA Women’s Final Four. Trophy agrees with Holly - the NCAA Women’s Final Four’s impact on Columbus will be long-lasting! Even if people can’t attend, there is still time to register for the NCAA Bounce presented by Buick, attend a Youth Clinic at Tourney Town presented by Capital One or have a ball at Super Saturday Night. Finally, don’t forget to tune in to see Holly (and Trophy!) on ESPN March 30 and April 1 for the games! Feb. 20, 2018 | Columbus is buzzing with basketball fever. In just a few short weeks, the OHSAA State Basketball Tournaments will begin and many of Central Ohio’s collegiate teams will start their conference playoff runs. No matter what level of basketball is being played, all eyes are on the main basketball event in Columbus – the 2018 NCAA Women’s Final Four! Men’s and women’s teams alike are excited for this once-in-a-lifetime event. 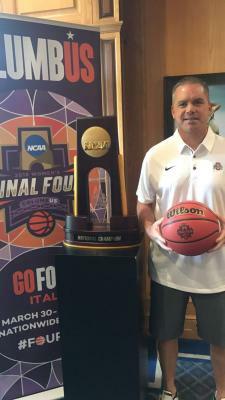 In fact, Trophy recently took a trip down High Street to catch up with the coach of one of Columbus’ hottest teams: Ohio State Men’s Basketball Head Coach Chris Holtmann! The men’s team has been on a roll lately with huge wins - most notably in January over No. 1 Michigan State and just recently over No. 3 Purdue. And just look how much fun they’re having! Of course, none of this success would be possible without great leadership. Trophy learned that Coach Holtmann was hired to take over at Ohio State when the program started to struggle in 2017. Since then, he has led the team to a stellar 22-7 record, where they currently are tied for second in the Big Ten. In fact, Coach Holtmann is also the first coach in 95 years to win his first seven Big Ten games. Trophy was seriously impressed. Most important to Coach Holtmann, however, is uplifting his players, and he is very excited for both the men and the women’s team to make an NCAA tournament run in 2018. Now, if you want to attend the Women’s Final Four, the time is here to buy tickets before they’re gone! Check out all the ways to get involved with the Women’s Final Four at columbuswff.com. We’ll see you for the next Trophy Tour stop! Feb. 5, 2018 | There’s a lot that goes into choosing an ideal city for the Women’s Final Four. The NCAA selection committee has to take many factors into account, from facilities and attractions to transportation and infrastructure. Fortunately, Columbus was the perfect location for the Women’s Final Four – and for Trophy! And a city as great as Columbus can’t rest on its laurels, but instead must keep growing and advancing to attract more great events and business. 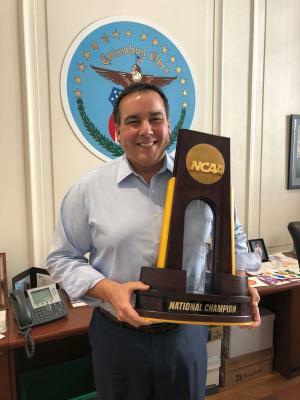 For this stop on the tour, Trophy paid a visit to the man in charge of making Columbus run smoothly – Mayor Andrew J. Ginther! This was the second time Trophy visited Mayor Ginther, and just like last time he had a very specific question: are we sold out yet? The answer to the question is no - but if you haven’t bought your tickets yet, hurry! Trophy told the Mayor there is a limited supply left. When he’s not keeping track of ticket sales, Mayor Ginther is a very busy man! He has been in office for just over two years now, and in that time he has done a lot to advance the city - most notably by being the driving force to help Columbus beat out 77 cities nationwide and win the Smart City Challenge! The winner of the challenge receives $50 million in grant money to improve residents’ quality of life, drive growth in the economy, provide better access to jobs and ladders of opportunity, become a world-class logistics leader and foster sustainability. Clearly, Mayor Ginther and his team are passionate about making Columbus global leaders across the board. The efforts of Smart Columbus will help greatly in bringing more sporting events to our city. Trophy reminded the Mayor that there’s more than one way to experience the Women’s Final Four! From volunteer opportunities to the activities at Tourney Town presented by Capital One, there are many free options that are open to young and old alike. And for guests who are coming from outside Ohio, the best way to get to know Columbus is Tourney Journeys, four tours that each showcase a different neighborhood of our beautiful city. You can sign-up for Tourney Journeys, register to volunteer or purchase tickets by visiting columbuswff.com. Jan. 26, 2018 | Columbus’ amazing food scene is one of the many attributes both locals and visitors rave about. Dubbed “the Best Ice Cream in America” by Time, Jeni’s Splendid Ice Creams, is a fan favorite and is now featured in over 30 scoop shops in eight cities around the country after starting in the North Market. Jeni’s fantastic artisanal flavors, made using whole ingredients and dairy from grass-pastured cows, have become a staple for many, including Joe Biden’s and John Legend’s. 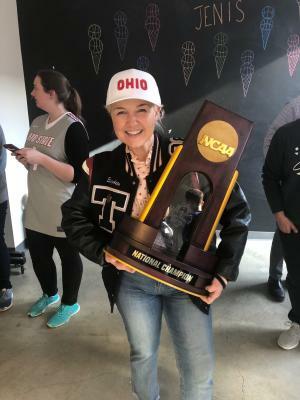 Our NCAA Women’s Final Four Trophy got the chance to meet the woman behind this ice cream enterprise on our second Trophy Tour stop: Jeni Britton Bauer! Jeni has put Columbus on the map as a top food and dessert destination, but she isn’t only America’s best ice cream-maker: she is a tour-de-force in the Columbus community who is incredibly passionate about making our city shine. Jeni is one of the city’s biggest champions, from being a diehard supporter of the Columbus Crew SC and the #SaveTheCrew movement to endorsing her favorite places to eat around Columbus. Upon meeting her, Trophy learned that Jeni is very excited for the Women’s Final Four and all of the fanfare it will bring to the city. She is especially excited for Tourney Town presented by Capital One, the NCAA Women’s Final Four Bounce and the many, many volunteer opportunities. 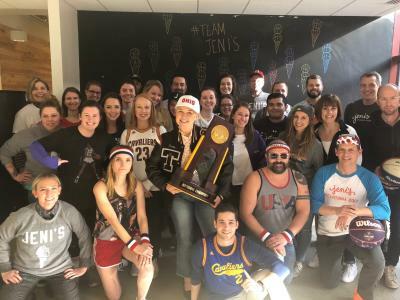 In fact, Jeni and her team were so excited to meet Trophy and learn more about the Women’s Final Four, they all embraced their inner basketball stars and donned their favorite jerseys. Who wore it best? Fans who come to Columbus for the Women’s Final Four can visit a variety of scoop shops, from the Short North Arts District to Grandview Heights to Easton to the original location in North Market. Whether you’re a local or a fan visiting Columbus for the Women’s Final Four, Trophy and Jeni encourage all fans to go out and try their favorite flavor (Trophy’s favorite is Brambleberry Crisp)! For more information on the Women’s Final Four, go to columbuswff.com. Don’t forget to stop by next week to meet the next celebrity guest on our Trophy Tour! Trophy made her debut during the 2016 NCAA Division I Women’s Volleyball Championship and has come out of storage to join us as we countdown to the NCAA Women’s Final Four. 70 days until we crown a champion in Columbus and Trophy has made it a priority to meet with her friends and discuss all things women’s basketball. 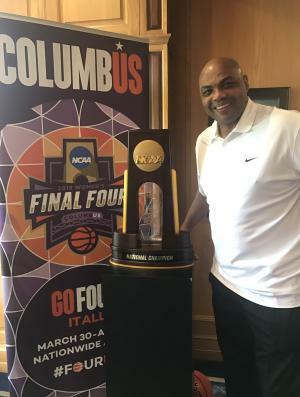 For the first stop on the tour, Trophy traveled to meet NBA legend Charles Barkley! But Trophy didn’t find him on a basketball court. Instead, Trophy went to Double Eagle Golf Club, where Mr. Barkley spent time perfecting his golf swing with other notable athletes and celebrities for the Nationwide Children&apos;s Hospital Invitational Celebrity Pro-Am hosted by Clark Kellogg. “Sir Charles” is a legend in his own right, having had a prolific basketball career. Growing up in Alabama, he played at Auburn and was highly successful, making an appearance in the NCAA tournament once and was named Southeastern Conference Player of the Year and an All-American. Afterwards, he went professional with the Philadelphia 76ers in 1984, and was in the same Draft Class as legends such as Julius Erving, Moses Malone and Micheal Jordan. Over the years, Barkley had a colorful and successful journey in professional basketball. He was named an NBA All-Star multiple times, became a franchise player and won the Most Valuable Player award in 1992. Trophy was excited to learn Barkley was also a member of the Dream Team at the 1992 Olympics, one of the most famous and talented sporting teams of all time. He also engaged in spirited rivalries with many other basketball stars, including Jordan, Magic Johnson and Shaquille O’Neal. Barkley’s impact on the game goes far beyond his playing days. Famously he said, “I don’t create controversy. They’re there long before I open my mouth. I just bring them to your attention.” His frank honesty and sense of humor have caused him to be a popular television analyst on TNT. Trophy was honored to meet such a legend and was very impressed with his extensive basketball knowledge. Barkley has had a tremendous impact on the game, and it was a thrill to have him visit Columbus. Who will be the next face on the Trophy Tour? Stop by next week and find out, and don’t forget—the Tour ends on March 30 at the Women’s Final Four! To pick up your tickets, sign-up to volunteer or learn about the FREE community events happening that weekend, head over to columbusWFF.com.